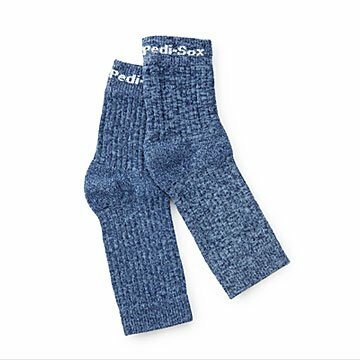 Keep feet warm by sliding on these strategic socks before a pedicure. Your spa routine includes a top-notch buffer, salon quality polish, and…toilet paper? There’s nothing luxurious about rolled up TP wedged between toes or worse: foam flip flops. It’s time for an upgrade. These super soft socks give the in-home pedi or salon trip a cozy twist. Slide them on your feet before painting and suddenly: cold floors and chilly walks to the car are nothing to be feared. It’s an elevated experience suited for the pedicure aficionado in you. Made in China. My daughter is always painting her toes and nails and I love that these socks let her do just that while keeping her feet and piglets warm and toasty! These are for winter. Your feet keep warm while your toe nail are drying. She puts them on before painting her nails and then feels cozy afterward. She gets cold easily. I bought these for myself & love how thick they are & how much they cover the feet as well as how high they come up on the leg.